The revolutionary Wilson T2000 was perfectly suited for Jimmy Connors. 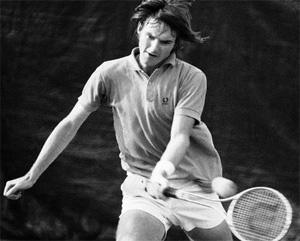 In 1968, Jimmy Connors won his first national singles title in the boys' sixteen championship. A revolutionary new addition to the game helped him do that. The Wilson T-2000--a tennis racket made of stainless steel instead of wood--was introduced in 1967, and Jimmy immediately took to it, not only for its jazzy looks but because it had a lot of power if the ball was struck dead center. Most players found controlling the ball quite difficult with this erratic new racket, but after so many years of accuracy drills with his Mom, Jimmy's consistency in hitting ground strokes made the racket an ideal weapon. That year, Gloria Connors came to a major decision about her son’s future. With that first national title, she knew he had it in him to be great, but she also sensed that she could not take him any further herself. "I had my game, and I had my strokes," Jimmy said later, "but I needed something more." When Pancho Segura came through St. Louis that year on a tour, Gloria made arrangements to meet him. "Pancho," she said, "I've got this kid. He's a good player." In addition to Little Pancho, Caroline Seebohm is the author of Under Live Oaks: The Last Great Houses of the Old South, Boca Rococo, and How Addison Mizner Invented Florida's Gold Coast. Her work has appeared in the Wall Street Journal, the New York Times, and other publications. An avid tennis player, she was a high school singles champion. Drawing on interviews with many in the game who knew or admired Pancho, Caroline Seebohm provides a close-up picture of the unlikely pro as his career first emerged in Ecuador and then developed further in the United States during the 1940s, where he broke down social and political prejudices with his charm, naturalness, and brilliance on the court. © Tennisplayer 2019. All Rights Reserved.